The head of the US Central Intelligence Agency, Porter Goss, says he will not hold individual officers accountable for failing to predict 9/11. Under CIA procedures, the agency's head can order an "accountability board" to probe mistakes and errors by officers. 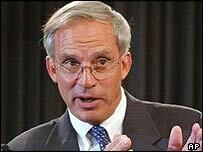 The CIA inspector-general recommended that boards be held to find out just who failed to predict or prevent 9/11. But Mr Goss has now rejected that recommendation, which was originally made in August. Mr Goss said in a statement that, after great consideration, he would not convene accountability boards. He said that no one person or group of people could have prevented the 11 September attacks. The most senior US intelligence official, John Negroponte, said he supported that decision. Most of the senior CIA officers who were serving at the time of the attacks have now left the agency - men like George Tenet, the former director, and James Pavitt, the former head of operations. They are now beyond the reach of the agency's disciplinary procedures. But there are many in Washington, inside and outside the intelligence community, who feel that the CIA failed very badly during the long years that Osama Bin Laden was building a network and plotting attacks against the US. Those critics will probably argue that Mr Goss is missing an opportunity to bring some accountability to America's spy agencies. A failure to bring accountability to US spy agencies?